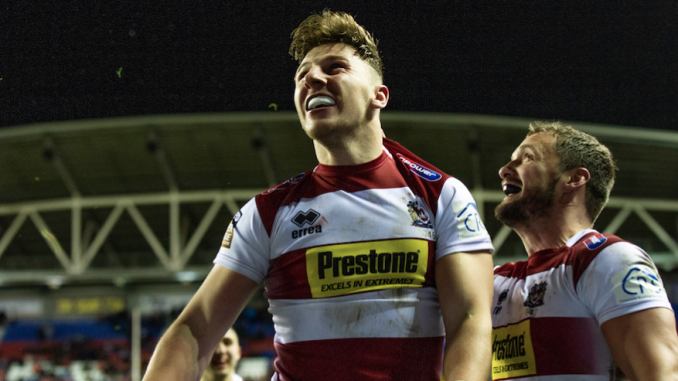 Wigan coach Adrian Lam lauded the performances of George Williams and Joe Bullock following their win over Leeds. The Warriors claimed their first win of the season by beating the Rhinos 34-16 at the DW Stadium on Friday night. Williams scored a try and helped set up a couple in a man of the match performance. Speaking after the game, Lam commented: “I’m happy for George because I worked pretty hard with him during the week. “He was a bit confused last week with the way I wanted him to play. I met him with him a couple of times this week and made it clear to him about how it was to be. “He played on both sides of the field which was excellent and that’s how he is going to become a better player. He nailed his last tackle kicks which he didn’t do last week. He was very good. Bullock also got on the scoresheet in another impressive performance for the Warriors, playing just his second game for the club following his off-season arrival from Barrow Raiders. Lam added: “Joe scored his debut try after last week’s performance and he has been outstanding for us. “I’m really pleased with his performance. When you think about the systems we have here at Wigan, it gives confidence for the way that our recruitment drive is. The players coming into the club are the right ones at the moment. “The most surprising part is that he used to be a winger and now a front-rower. He is still really raw, but the exciting thing is that in two years time, who knows where is going to get to? Lam also revealed that Dan Sarginson is a doubt for the World Club Challenge after rolling his ankle.